Shekhar Memorial Foundation (SNMF) was established in the memory of our beloved son Master Shekhar Naidu, whose thirteen years of presence in our life was a memorable and magically journey. Shekhar was instrumental in giving better life to two little angels, who have multiplied our joys and happiness. Unfortunately the happiness of a complete family did not stay long with us. 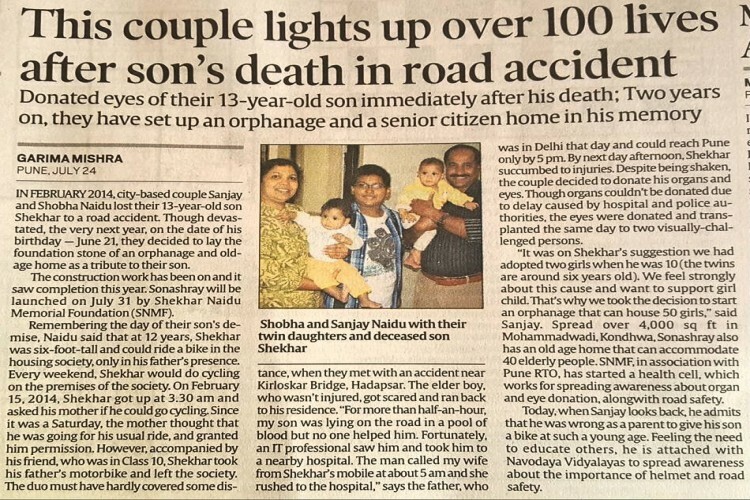 We lost our most loving Son in a road traffic accident. But even as he left this world he brought light in the life of two visually impaired individuals by donating his eyes. SNMF is a Charitable Organization working towards providing Home & support to the orphan girl-child and is committed towards working for ‘saving a Girl child’ by providing home, education and making them self-sufficient and independent in future. At SNMF we plan to take care of their all-round growth and development. We also wish to provide an Old Age Home for the second-inning-care of the elderly people who for some reasons would want to stay at this home-away-from-home. Also, we conduct Awareness Seminars and Workshops on issues pertaining to Girl-child and elderly people. To give shape to the above mission, we had constructed an orphanage for accommodating fifty girl-children and forty elderly people, here at Pune. Our foundation is also working towards Organ donation and Eye donations. Presently more than 1500 individuals have already pledged their organs. By God’s grace we have succeeded in our first step of providing a shelter for the orphan girl-children and old aged people by constructing ‘SONASHRAY’- an orphanage & Old age home. To sustain the above mission of SNMF, we hereby request you to be a part of this effort to make it a sustainable model for orphan kids and old-age home. Your share could be as good as a donation for Shekhar Naidu Memorial Foundation! Not everyone can afford to take care of their loved ones. Shekhar Naidu Memorial Foundation's life can only be saved by donations made by kind people like you.